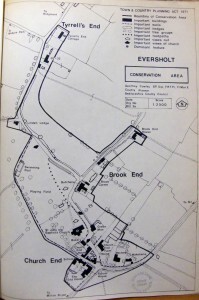 Eversholt includes a designated conservation area, defined since 1972. It has some planning implications. One limitation is that trees are not supposed to be felled or pruned in the area without permission, although the interpretation of this rule is somewhat variable. Neither central Beds not the Parish council seems to have a copy of the conservation area documents online, especially no map. Amazon acknowledge the existence of the document but have no paper copy to sell. Google don’t have a copy, but they do know where to find one. According to them, the nearest paper copy is in a library in Zurich, Switzerland. That’s The Department of Civil, Environmental and Geomatic Engineering, Swiss Federal Institute of Technology Zürich. How convenient for us! In fact, there’s a tatty copy in a filing cabinet in Bedford Library. 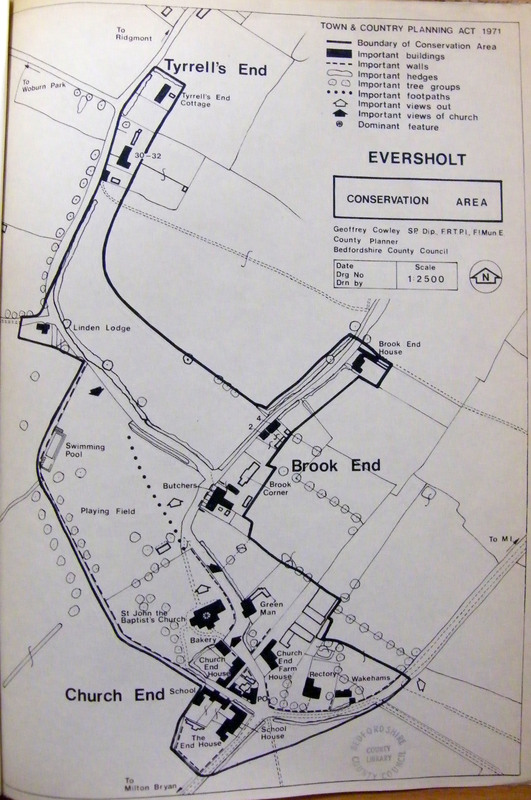 So here, attached below as a pdf, is a photographic copy of the original document establishing the area, including a map. Copyright of the paper copy undoubtedly belongs to someone, but just who is anyone’s guess. So, for the convenience of the residents, here is an online version. A review document was published in 1992, but the contents of this is unknown. Does anyone have a copy, please? This map is included in the pdf below, but here it is as a separate image. Click the image for a bigger version. Click here to download the pdf of the whole conservation area document.